My windshield covered in frost. I came out to my car one cold autumn morning to be greed with the first serious frost of the year. 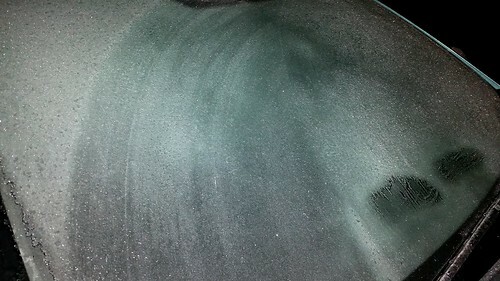 My car proved most striking in that the windshiled had a thick frosty coating. But in the darkness of the early morning with a streetlight somewhere off, it made the windshield sparkle. This photo doesn't capture it as well, though it does if you click through and zoom in. But what I also found striking is how the wiper-blade path and where the heat comes out were less effective and you can trace their impact upon the windshield as if they have left a permanent grove upon the glass.